With its comprehensive coverage of key food safety concepts, the ServSafe® Coursebook with Answer Sheet 7th edition will completely prepare readers for the ServSafe Food Protection Manager Certification Exam, and, more importantly, it will promote adherence to food safety practices in the workplace. It is the ideal solution for the academic setting, multiple-day training, or individuals in need of more extensive food safety training. 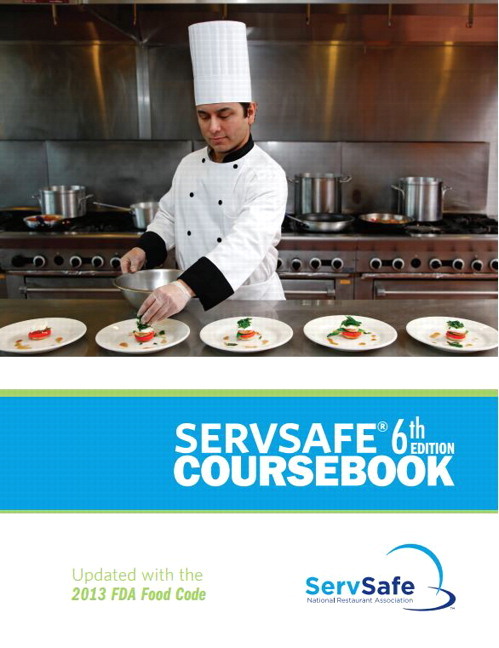 The ServSafe Coursebook is available packaged with MyServSafeLab™. MyServSafeLab™ is an online homework, tutorial, and assessment program that truly engages students in learning. It helps students better prepare for class, quizzes, and exams–resulting in better performance in the course–and provides educators a dynamic set of tools for gauging individual and class progress. Students, if interested in purchasing this title with MyServSafeLab™, ask your instructor for the correct package ISBN. MyServSafeLab™ is not a self-paced technology and should only be purchased when required by an instructor. Instructors, contact your Pearson representative for more information. A learning recipe for success from the industry’s leading food safety training and certification program! The Seventh Edition is built to reflect the NRA’s new job task analysis for food protection manager certification. UPDATED: Greater emphasis on active managerial control with a transition away from HACCP. UPDATED: Modifications throughout every step in the flow of food, from purchasing through service. UPDATED: Adjustments made to personal hygiene guidelines as well as cleaning and sanitizing requirements. UPDATED: The text has received a complete design overhaul, including refreshed art, layout, and activities. Common workplace language is used throughout the book to help readers understand the concepts better, and identify how they will be used on the job. Study questions are written in the same style as the ServSafe Examination to help students better prepare for the exam. Real-world scenarios help students learn by experiencing actual on-the-job food safety situations. Student Activities are included at the end of each major topic to give students the opportunity to practice key concepts. The “Apply Your Knowledge” feature reinforces key concepts by providing students with situational scenarios to apply concepts they have learned for practice and reinforcement. Fill in the blank, matching, and true/false exercises are provided. The “You Can Prevent This” chapter opening features introduce each chapter topic with a real world scenario to showcase chapter concepts and engage students. The “Something to Think About” feature highlights real world outbreaks and their consequences to show the importance of food safety. Photography showing activities from the learner’s point of view helps students more easily identify what they will see on the job or in the classroom. Visual cues are included on photos showing both the proper and improper procedure to help students instantly identify right and wrong practices. To highlight important topics, sidebars are included in each chapter, focusing on business needs, regulatory concerns, and the resources available to aid in the understanding of food safety. 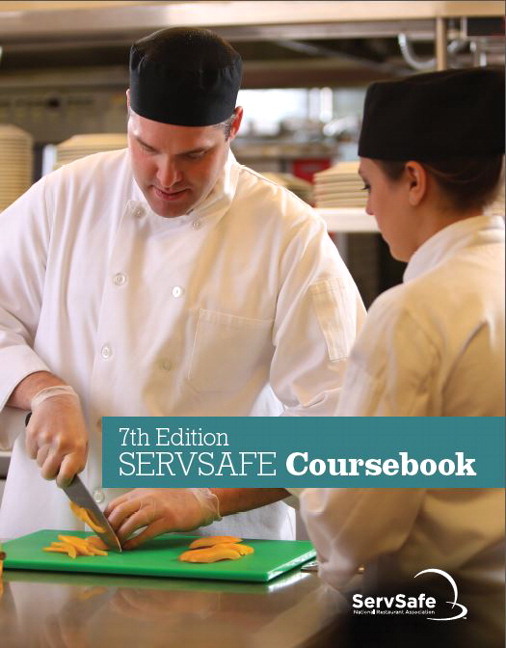 The ServSafe Coursebook is available packaged with MyServSafeLab™. MyServSafeLab, an online assessment and learning system, reacts to how students are actually performing, offering data-driven guidance that helps them better absorb course material. With advanced pedagogical features such as personalized study plans, book-specific learning outcomes and objectives, and standards management, MyServSafeLab allows for a truly integrated learning experience with the textbook. Students, if interested in purchasing this title with MyServSafeLab, ask your instructor for the correct package ISBN. MyServSafeLab is not a self-paced technology and should only be purchased when required by an instructor. Instructors, contact your Pearson representative for more information. ServSafe® Exam Preparation improves students’ success rate on the ServSafe exam from the NRA.Exam Prep delivers a comprehensive exam of 90 questions on demand. The questions are written and grouped based on the 5 ServSafe domains just like the actual NRA exam! Students can take the exam as many times as they like and each time it will be a little bit different since the test is generated from a large pool of questions. Comprehensive feedback on each question and overall score is automatically provided. Dynamic Study Modules will help students master the content in less than half the time of traditional approaches! The Dynamic Study Modules continuously assess a user’s performance and activity in real time. They adapt to a student’s answers and level of certainty and customize the experience to target particular strengths and weaknesses as they go. Learning Modules are frame-by-frame presentations that deliver key information for the entire course. Textbook images, embedded assessments, and audio narration underscore key points and aid in studying. Real World Videos: Presentations from people involved in the foodservice industry sharing their perspectives/experiences. NRA Videos: Just over 2 hours, these videos include a mix of didactic presentations and scenarios. Automatic Grading and Performance Reporting help save time and improve class results. Automatic grading features visual reports for overall class achievement and individual student achievement so that you’ll be able to identify at-risk students earlier than ever before! The Interactive eText allows for a completely digital experience. This user-friendly, “go anywhere” tool is included with MyServSafeLab and provides an electronic experience for your PC, Mac, or iPad. Features include the ability to highlight, take notes, bookmark pages, search, and more. Chapter Review questions, Discussion Questions, and Case Studies give your students even more opportunity to review and apply the core knowledge within ServSafe. Electronic Flashcards are great for individual, group, or classroom study; they turn repetitive study into a fun, interactive activity. NEW! Sixteen new drag and drop activities to provide active practice for students in key chapter areas like time and temperature, HACCP, Pathogens, Sanitizing and Pest Management. NEW! Six current news articles with accompanying comprehension questions on key topics like chilled storage, catering, sanitation, and pest management. NEW! Seven new case studies have been added where text content was updated including topics like proper use of gloves and allergens. NEW! MediaShare for sharing and collaborating around videos students and professors upload. Learn more here. UPDATED! Dynamic Study Modules, all end of chapter materials, flash cards, and test questions have been updated based on new text updates.